How are y'all doing today? Our hearts go out to those of you who may be in a country or state where wildfires are raging or where there is flooding or other disasters. 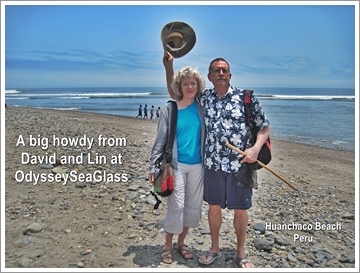 Lin and I are currently living with our daughter and son-in-law in the State of Maryland, USA, as some of you already know (wish we were in Huanchaco "howdy" photo right now!). Although there are beaches not far from us, they are on inner waterways with not much wave action. 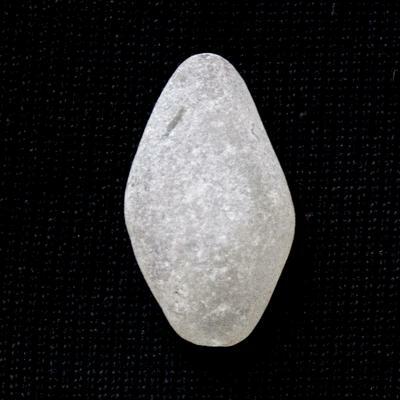 The beach glass we find near here is sometimes quite old but still has jagged edges with little rounding. 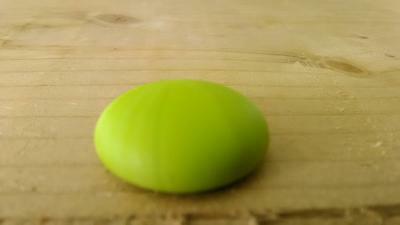 For that reason, we haven't been able to restock much of our sea glass for sale. However, we have received a gift of a lot of impressive sea glass from our friend Ginnie in Jamaica. 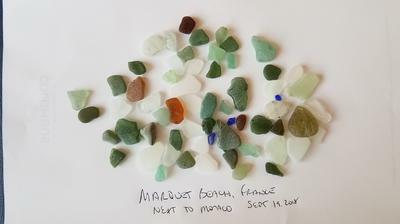 She has sent us some beautiful colors and patterns of sea glass from Jamaica. Thank you so much Ginnie! 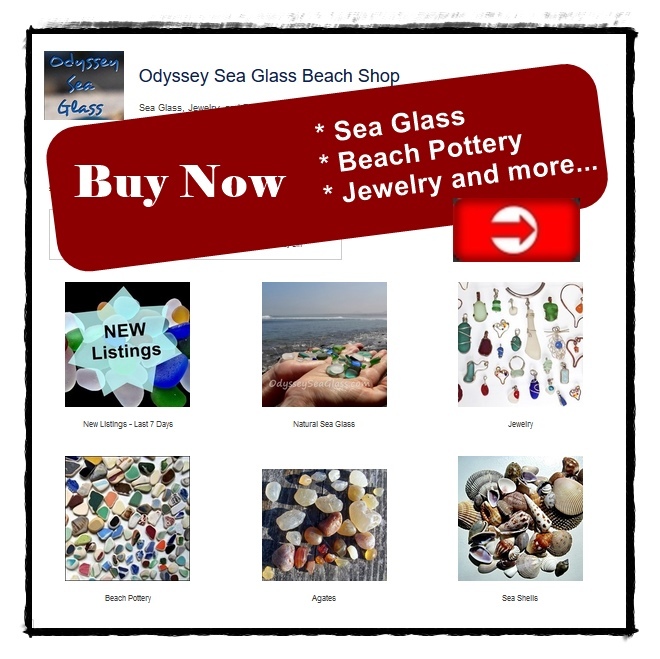 To show our appreciation that gift, Lin will be making Ginnie some jewelry from select pieces of her glass..
As a result, we now have a limited amount of select Jamaican Beach Glass for sale in our store (see below). When you get to that page, keep scrolling down to see the series of photos and info Ginnie sent us over a period of time. Very exciting! 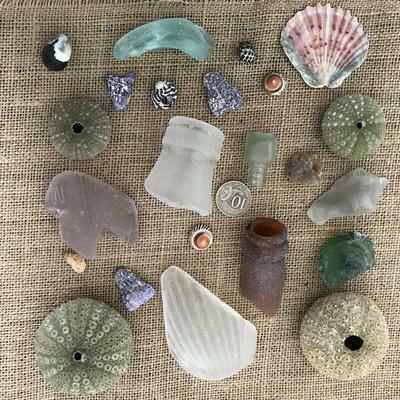 Here's what you'll find in this November 2018 edition of the Odyssey Sea Glass Newsletter. In general, low tide is the best time to find sea glass. Why? In all cases, more beach is exposed at low tide. 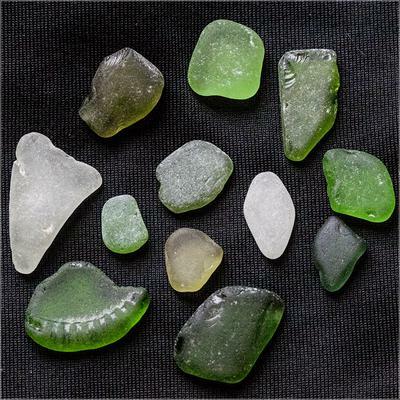 In most cases, sea glass can be found distributed fairly equally between the high tide and low tide lines. 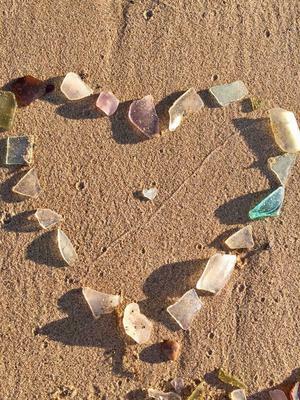 On some beaches, most of the good sea glass is found only at the very low tide line. An example would be Seaside, California. Other beaches are not accessible at high tide due to rocks and cliffs. To simplify matters, here we present tides in general terms. This will fit fairly closely with what you'll find at beaches near you. However, local factors such as bays, headlands, islands, etc, will affect the timing of the tides. Tides are caused mainly by the moon. The moon's gravity pulls the earth's water towards it. The sun (being much farther away) also has a similar but much smaller effect. At about the time when the moon is directly overhead, the higher tides occur. Directly opposite the moon, on the other side of the earth, the water also bulges out to compensate, causing a secondary (antipodal) high tide each day. The moon orbits the earth about every 24 hours and 50 minutes. So if the highest tide today is 1:00 p.m., tomorrow it will be at about 1:50 p.m. Since there are two bulges (sublunar and antipodal), there are two high tides per day, about 12 hours and 25 minutes apart. Logically, there are also two low tides per day. So the time between high tide and low tide will be about 6 hours. 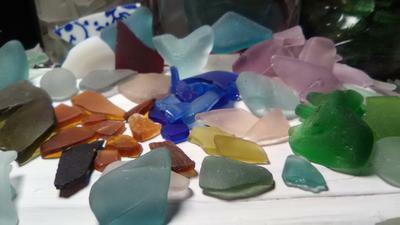 To make the most of a sea glass day, plan your trip when high tide is in the early morning. You'll be able to start hunting while the tide is dropping and be able to count on a fairly clear beach for most of the day. High tide at 6:00 a.m. Low tide will be about 12 noon and the next high tide about 6 p.m. If you get to the beach at 7:00 a.m., you'll have a lot of beach showing until about 4 p.m. Warning! Some beaches that appear to be safe at low tide are dangerous at high tide. This is especially true of any beach that is in front of cliffs or large rocks. You may get stranded or worse when the tide comes in. Always check to make sure what time high tide is so that you will not get caught by the tide coming in. Tide charts are usually available at your local fishing supply store or bait shop. To check tides online, go to the official NOAA site and find spot nearest your beach destination. Please take a look at our store while you have a few moments as we are continually adding items that you may not have seen before. Continue reading "Possible design? " Continue reading "What would this turquoise nugget have once been a piece of?" 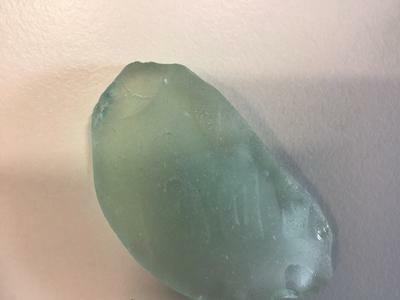 Continue reading "Looks like sea glass.... but it's not clear...?" Continue reading "What is this???" Continue reading "Malta & Gozo"
Continue reading "Roque Bluffs State Park"
Continue reading "# on seaglass"
Lavender glass bottom shard - marked something “LY” then “11th”? Continue reading "Lavender glass bottom shard - marked something “LY” then “11th”?" Continue reading "Black or Olive Green?" Continue reading "Anyone know what this is. " 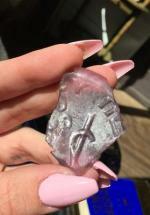 Continue reading "west beach uk"
Continue reading "Black glass found on galveston island"
Can anyone tell me if any of these pieces are sea glass. 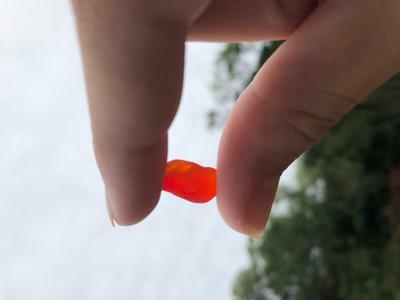 They came from Outer Banks, N.C.
Continue reading "Sea Glass or not"
Monday October 1st, Lake Erie, edgewater beach, found this old piece of a Pepsi cola bottle! 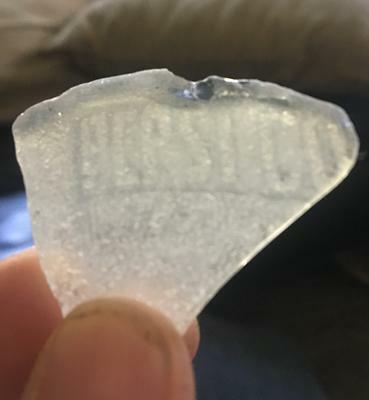 Continue reading "Monday October 1st, Lake Erie, edgewater beach, found this old piece of a Pepsi cola bottle!" 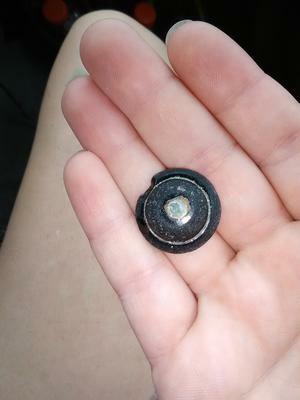 Continue reading "Lake Erie "Lucky Stones" 9/15/2018 "
Continue reading "Wow - Lake Erie Treasure 9/15/2018"
Continue reading "Tolchester & Betterton MD"
9/29/2018 Dauphin Island Alabama! Sea Glass in Alabama! I think so! Continue reading "9/29/2018 Dauphin Island Alabama! Sea Glass in Alabama! I think so!" My Beautiful Red Piece! I have many Amazing piece's from our Bays and Beaches here in Alabama. We go every low tide! 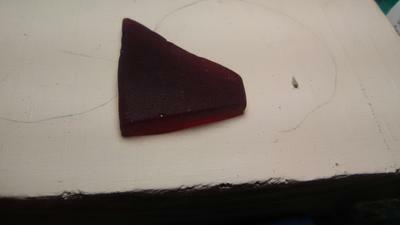 Continue reading "Dauphin Island Al"
Continue reading "Sept 14 Lake Erie Beach Glass Deep deep red. Very old"
Continue reading "Marquet Beach, France, near Monaco"
I’d like to identify what this piece’s origin possibly is and it’s rarity and color. Continue reading "I’d like to identify what this piece’s origin possibly is and it’s rarity and color." 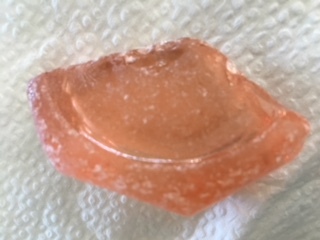 Found thos piece of beach glass in Lake Michigan just off Beaver Island. It is white, approx size is 2 inches. The markings are UNT.40Z. 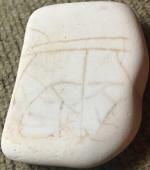 Continue reading "Found thos piece of beach glass in Lake Michigan just off Beaver Island. It is white, approx size is 2 inches. The markings are UNT.40Z." 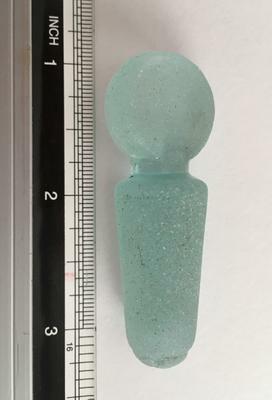 How old is this piece of glass? Continue reading "How old is this piece of glass?" the largest piece of orange I've ever found! 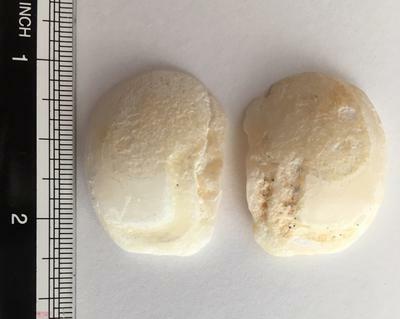 Continue reading "9-8-18 private beach"
Giardini del Tempio Voltiano Como Lake Como, Italy I found about 30 pieces of green, clear and brown beach glass and one piece of opaque white glass. 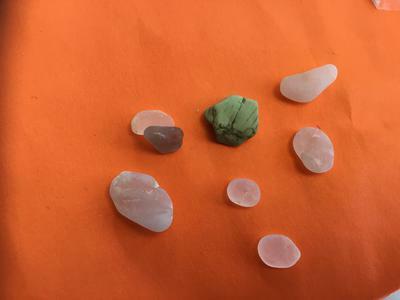 Continue reading "Giardini del Tempio Voltiano"
Continue reading "Some sea glass and beach finds from Sydney Australia"
Continue reading "Keyport beach "